You can download and print the Vet Referral form here. Debbie Richmond has been around horses all her life and has ridden since a small child. She currently has 4 horses, 3 of which are home bred & compete in all disciplines. 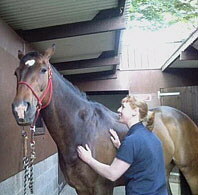 Her own horses enjoy regular massage treatments which has improved their competition performance and behaviour. She has spent time working on dressage, livery and training yards, in the UK and Australia, and is a qualified British Horse Society Intermediate Stable Manager. Debbie is always happy to help so if you have any questions please don't hesitate to get in touch. Richmond Equine Massage is based in North Yorkshire and Debbie offers Equine Sports Massage at your own establishment anywhere in the county. Each massage treatment begins with an evaluation of the horse's conformation and movement, and an assessment of any muscular asymmetry. Massage can be used pre-event to warm the muscles and prepare the body for exercise,reducing the chance of injury. Post-event massage reduces muscle fatigue and shortens recovery time. Different routines are specially designed for different situations using various massage techniques. 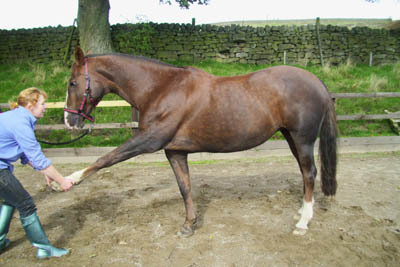 Any horse, large or small, young or old, competition horse or family pet can enjoy the benefits of massage.